Railpictures.ca - Doug Lawson Photo: CN 9300 at the Calder diesel shop in Edmonton, Alberta. I believe this is one of two GP35′s that CN had and was originally numbered 4000. Anyhow, on this winter afternoon I had done a quick sweep through the shop area on the way to work and found this unit there. It was dead and drained, whistle and exhaust stack taped and capped, bell missing and obviously not in service. Really don’t know the disposition of the 9300 and why it was there. I can’t recall if I took an image or two of the old wooden boxcar and tank behind the unit, never know what I might find in a dusty yellow slide box. | Railpictures.ca – Canadian Railway Photography – photographie ferroviaire Canadienne. 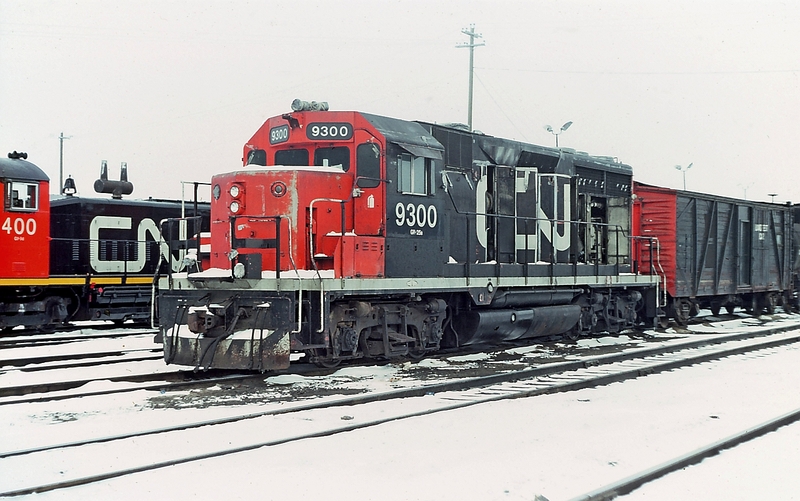 Caption: CN 9300 at the Calder diesel shop in Edmonton, Alberta. I believe this is one of two GP35's that CN had and was originally numbered 4000. Anyhow, on this winter afternoon I had done a quick sweep through the shop area on the way to work and found this unit there. It was dead and drained, whistle and exhaust stack taped and capped, bell missing and obviously not in service. Really don't know the disposition of the 9300 and why it was there. I can't recall if I took an image or two of the old wooden boxcar and tank behind the unit, never know what I might find in a dusty yellow slide box. Earliest shots I’ve seen of it on DMVW were in 1989 on rrpa, in full DMVW paint no less. There’s a shot it sitting dead at CN’s PSC shop in 1989, I guess it was sold off and fixed up sometime after then for the DMV&W. CN 9300 went to the Dakota, Missouri Valley, and Western as their 323, has since been scrapped.